Have you ever had a customer complain about a lost package or that it was taking too long to receive their order? Amazon is putting a live mobile tracking feature on their map, allowing customers to know when their expected package is nearby. Many online retailers have overlooked the importance of tracking, or rely too heavily on UPS to give customers an ETA. This new feature eliminates the annoyance of having to go through a different website for a consumer to find out where their package is, and it also helps create a more personalized experience for the customer. The mobile feature, according to Retail Dive, allows customers to see an update on their expected delivery when the package is within 10 delivery stops of their location. The customers can see the location of the delivery vehicle on a map at any time. Announced last fall, it is now available for all packages delivered from Amazon throughout the U.S. Amazon also recommends all of their sellers to include shipping tracking numbers upon shipment confirmation as they are 2x less likely to receive negative feedback. Better feedback means happier customers. What does this mean for your e-commerce company? You probably already offer tracking information with shipment confirmations, which means you’ve got a head start. 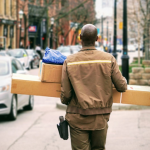 Customers are more likely to come back to your online store if they know where their package is after it ships, as it creates a more convenient and painless process. According to Kissmetrics customers care significantly about when and where they will be receiving their product. Another great way to keep customers informed about their packages is by sending them a personalized text message when their package has shipped, and when it has arrived at the given location. Tasting Room, a personalized wine tasting experiences for customers who want to try new wines, uses Narvar tracking system to give customers an accurate delivery date even before a carrier scan. TR also texts customers with updates on their package, making it easier for them to see where it is without having to search through a ton of emails. Cart abandonment is an often-cited problem in e-commerce, so making sure your customer is satisfied with the check-out process is super important. Keep customers interested by letting them know early on they will have easy-access for tracking their package. If they know that at least one step will be easy for them, it will help to ensure that sale. Putting a live mobile tracking device for a customer’s order could very well be the way of the future. New features for e-commerce are constantly coming out to keep customers engaged, happy, and coming back for more, so it’s important to keep up with what’s going on. For more information on Narvar, you can visit their website.